I have received two more pairs of lenses to review from Klenspop.com! This time I will review both of them on this post! As usual, the lenses arrived fast and safely packed in a lot of bubble wrap. Your orders will always come with a little paper with instructions on how to put on and care for your lenses! You can find the same instructions on the back of each lenses' box too. If it's your first time wearing circle lenses, these are really helpful! Okay! Now for the reviews! Inside your box, you will find a pair of tweezers, a little case and, of course, your lenses. I found their design super cute! These lenses are REALLY small, and you might be wondering why that is, since the last lenses I reviewed were 14mm in diameter as well but were very enlarging. The actual coloured part of these lenses is only 13.3mm in diameter, and even so, the black bold line around them still give them a little more enlargement. This isn't necessarily a bad thing if, for example, you're looking for a more natural look or to cosplay a character with smaller eyes! I was a bit disappointed to see the color on my eyes, because it's not very vibrant and might not be very visible in some lights. I think these lenses would probably work better with lighter eyes to get a more dramatic effect. They hurt me a bit when I put them on, but, after than, they were pretty comfortable! I have very sensitive eyes, so, if you don't, they might not hurt you at all. If you have dry eyes like me, I recommend putting a couple of drops of the lens solution or saline solution on your eyes! 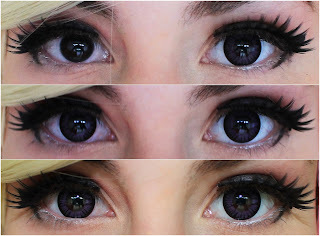 If you're looking for a pair of purple lenses that you can both wear for cosplay or in a daily basis, without them looking dramatic or too fake, I would recommend these! These are also super nice for cosplaying male characters (who usually have sharpen and smaller eyes)! I personally would wear them for that! You can get these lenses here for only $13.00! So, again, I found my new tweezers, case and blue lenses inside the box! When I first saw the lenses I though they were really dramatic and I actually feared I wouldn't like them. I was so wrong! They definitely enlarged my eyes a LOT! They are pretty small, that's a fact, but I still wasn't expecting so much enlarging. After I was done with my make-up, I felt like a doll! And I just LOVE dolly looks! If you want your eyes to POP a lot, I don't think I've tried any lenses that were better than these! These lenses have the most beautiful, vibrant blue I have ever seen! I have another pair of blue lenses which I bought a long time ago and you can barely see the blue on my eyes, I always have to photoshop them when I wear them. But these are just perfect! Being such a light blue, I though they would look darker on my dark eyes, but they didn't. The color isn't very natural, obviously, but I adore it! Just like the purple ones, they made me tear up a bit when I put them on. They did make my eyes a little dry after a while wearing them, but not enough that would feel the need to put on some liquid or take the lenses off, so it was ok! If you want to cosplay a character with big, blue eyes, or are looking for some vibrant blue lenses that will complete your dolly look, I would completely recommend them! They are so gorgeous! I just can't wait to cosplay more blue-eyed characters to show them off! You can get these lenses here for only 9.50$!! Hurry up before the sales end!